It stressed “the principles of defense, self-defense and post-emptive strike.” It said China isn’t aggressive. It will “counterattack” if attacked. China’s navy will defend offshore and “open seas” waters. Cybersecurity will be prioritized. Beijing opposes weaponizing space. It “vowed to secure its space assets.” It pledged no nuclear arms race with other countries. It fundamentally opposes hegemonism and power politics in all forms. It faces multiple complex security threats – including “illegal, military presence on China’s territory, and outside parties involving themselves in South China Sea affairs,” a clear reference to US regional meddling. Beijing considers US South China Sea surveillance flights unacceptable provocations. The Pentagon admits flying its most advanced P-8A-Poseidon spy plane regularly in the area – monitoring Beijing activities primarily. “China will have no choice but to engage” in response to US provocations. Beijing’s waters are its own. Its message says it won’t tolerate US intervention where it doesn’t belong. China is concerned about America’s increasing Asia/Pacific presence as well as Japan’s intent on “overhauling its military and security policies” cooperatively with Washington. “(A)nti-China forces have never given up their attempt to instigate a color revolution” against Beijing, the white paper said. The risk of potential conflict is real. They want Beijing challenged in its own part of the world – perhaps belligerently. On the one hand, they slam China’s legitimate military presence in its own territory. On the other, they ignore menacing US bases, nuclear-armed navy and tens of thousands of US combat troops close to China’s borders – a direct threat to its security. Last week, US Pacific Command (PACOM) hosted military officials from 22 Asia/Pacific countries in Hawaii. China notably was excluded. A symposium discussed amphibious military strategies, tactics and capabilities. A US marines amphibious assault demonstration was featured. Washington aims to integrate amphibious operations with Pacific area nations and ally them against China’s growing regional strength and influence. Defense Secretary Ashton Carter said Washington may expand military patrols in Pacific rim waters – including around China’s Spratly Archipelago land reclamation project involving construction of artificial islands atop coral reefs. US Pacific fleet commander Admiral Harry Harris accused Beijing of building a “great wall of sand” in disputed waters. The area involved is 1.5 square miles. “How China proceeds will be a key indicator of whether the region is heading towards confrontation or cooperation.” Harris said. America’s belligerent presence risks the former. Apparently nothing was learned from lost Korean and Southeast Asian wars. China justifiably claims the right to build in its own territorial waters – “indisputable sovereignty over the Nansha (Spratly) Islands and adjacent waters,” it says. She stressed China will defend its territorial sovereignty. Unauthorized intrusions will be challenged. 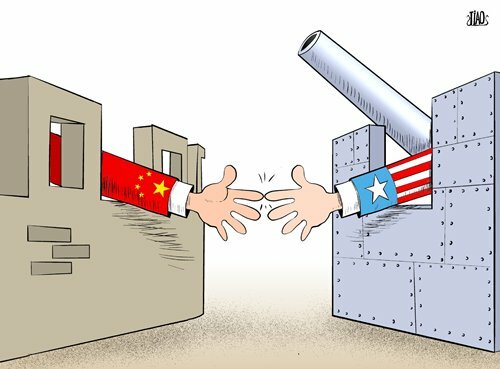 Longstanding US overreach may lead to direct confrontation with China. The risk of potential conflict is real.